It’s a good thing Neanderthals didn’t brush their teeth, otherwise we humans might not have been able to find out what they ate. An international team of scientists analyzed the DNA found in the tooth tartar of five preserved Neanderthal specimens, revealing a snapshot of the kinds of food included in the cavemen’s diets. Some ate meat while others only seemed to have plant DNA loaded into their teeth. The researchers could also tell which kinds of bacteria lived in their specimens’ mouths, and thought some of the Neanderthals might have even used natural painkillers. The conclusions can be a little speculative, so think of the study as a snapshot of what some Neanderthals ate, rather than comprehensive look at their behaviors. Still, the results excited scientists. Our distant cousins, extinct for the past 40,000 years, lived throughout modern-day Europe and had the same dental problems we do, with plaque that turned into tartar from lack of proper dental hygiene. That locked bits of food DNA into their teeth, which the scientists identified using polymerase chain reaction amplification and shotgun sequencing, similar techniques used in forensics when detectives have a tiny blood sample from a crime scene. In this case, the crime scenes were the El Sidrón cave in Northern Spain and Spy cave in the Netherlands, and the forensics specialists were only interested in what the hunters ate. The results revealed all sorts of interesting tidbits. The Spy cave plaque had all sorts of meat DNA, like sheep and even wooly rhinoceros. The El Sidrón teeth only seemed to contain vegetable DNA—mushrooms, pine nuts and moss. These diets even appeared to reflect different microbiota, or a different assortment of bacteria on the teeth. The researchers published their results today in the journal Nature. This dietary diversity is quite large, especially since many assume Neanderthals only ate meat. And even the meat-only observations might have simply reflected the location of the site. Neanderthals, like other early humans, often ate according to the regional availability of foods. 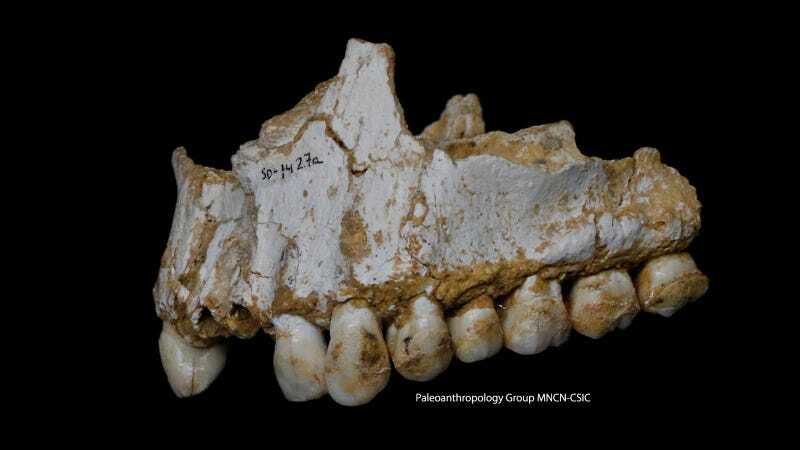 One surprising aspect of the study was that a Neanderthal with a dental abscess appeared to contain teeth with traces of poplar tree DNA, a plant which contains the chemical humans use to make aspirin. The scientists hinted that this Neanderthal might have been self-medicating his wound. “But that’s really speculative,” said Harcourt-Smith. “It could have been consumed because they were hungry. To infer the Neanderthals had a sort of intense knowledge of the properties of the plants is going too far.” It’s just a single example which is bit like finding a human corpse with poppy seed DNA in their teeth and assuming they used opiates. A reminder: Correlation does not equal causation. There are several other caveats to the results, Harcourt-Smith explained. We don’t know how long it took that plaque to form on their teeth, so we don’t know whether these snapshots represent full diets or just quick snapshots. The study’s authors discuss contamination throughout the paper, and even compare the samples to modern-day humans. “You can see that the researchers try to be very careful and they take these issues very seriously,” said Harcourt-Smith. He still would have liked so see more modern-day humans analysis to compare with Neanderthal microbiota. Harcourt-Smith didn’t feel confident speaking to the DNA analysis, so we reached out to other geneticists and will update the post if we hear back. But ultimately, it’s pretty cool just to be able to picture Neanderthals actually sitting in their cave eating rhinos or moss, unaware that in thousands of years, their cousin 20,000 times removed might be giving them a high-tech dental exam. It might make a good case not to brush your teeth for the benefits of your future descendants.